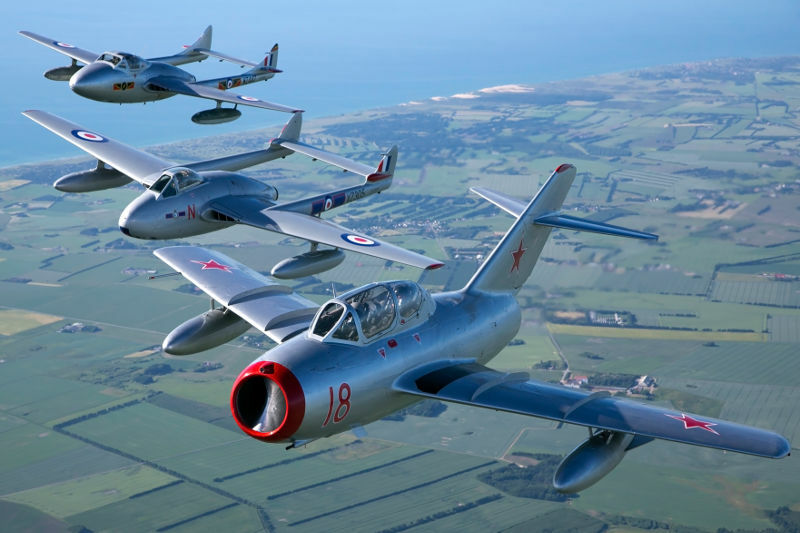 The Norwegian Air Force Historical Squadron will be bringing their explosive MiG-15 and Vampire display to Wings & Wheels this August Bank holiday. Visitors will be thrilled as the Mikoyan-Gurevich MiG-15 demonstrates why it was one of the first successful swept-wing jet fighters, with high octane manoeuvres and a simulated battle with the added excitement of pyrotechnics as it displays with the de Havilland DH.100 Vampire. The de Havilland DH.100 Vampire was a British fighter jet developed during the Second World War. The MiG-15 aircraft was developed for the Soviet Union and achieved fame in the skies over Korea, where, early in the war, it outclassed all straight-winged enemy fighters in most applications. The MiG-15 is believed to have been one of the most widely produced jet aircraft ever made. In excess of 12,000 were manufactured and licensed foreign production may have raised the production total to over 18,000. Some among them were Polish-built variants of which the Norwegian Air Force Historical Squadron’s example is one. The MiG-15 is often mentioned, along with the North American F-86 Sabre, as the best fighter aircraft of the Korean War, and among the best fighter aircraft of all time. The MiG-15 remains in service with the North Korean Air Force as an advanced trainer. The MiG-15 is also well known for its role in the Korean War – a conflict which involved the Royal Navy operated Hawker Sea Furies. Piloted by Lieutenant Peter ‘Hoagy’ Carmichael, one such Sea Fury FB11 made history when it downed a MiG-15; one of the very few times when a piston-engined aircraft has gained superiority over a jet. The MiG-15 on display at Wings & Wheels wears the markings of the aircraft flown by famed Soviet cosmonaut Yuri Gagarin before he became the first man to visit outer space in 1961. The de Havilland DH.100 Vampire was designed to harness the newly developed jet engine and entered service with the RAF in 1945. It was the first fighter jet to be powered by a single jet engine. The RAF used the Vampire as a front-line fighter until 1953, when it assumed the role of pilot training. The de Havilland Vampire jet achieved a series of aviation firsts, including being the first British plane to exceed 500mph as well as the first jet fighter to cross the Atlantic. It was retired in 1966 and replaced by the Hawker Hunter and Gloster Javelin. Around 3,300 Vampires were manufactured. The Royal Navy’s first jet fighter was the Sea Vampire, a variant of the plane operated from the Navy’s aircraft carriers. As such, the Vampire was the first plane to be landed on a moving aircraft carrier. The Norwegian Air Force Historical Squadron was founded in 2008 and is based at Rygge Air Base Norway. Visitors to Wings & Wheels can also enjoy other air displays including show favourites the Red Arrows, Battle of Britain Memorial Flight (Lancaster, 2 x Spitfires), Chinook, the Tigers Parachute Display Team, The Blades, Jet Provost, Hurricane, Strikemaster, O’Brien’s Flying Circus, the Bronco Demo , Richard Goodwin, The Turbulent Display Team, B-17 Flying Fortress Sally B, NAHF Vampire Pair, NAHF MiG 15 and Fireflies Aerobatic Team, accompanied by witty and knowledgeable commentary from aviation experts and display pilots. The ‘Wings’ of the event would not be complete without a close-up inspection of all the weekend’s visiting aircraft including Dunsfold’s resident Boeing 747 in the ‘Wings Park’, the Brooklands VC10 and Aces High DC3, all open for tours. Supercars and classic and vintage icons put on an awe-inspiring display of power and speed on the Top Gear track in a 2 hour auto spectacular. The ‘Wheels’ of the show includes displays from McLaren 12C, Lamborghini Aventador Roadster and Huracan, Pagani Zonda, Ferrari California T, Aston Martin Rapide, Dodge Monaco, TVR Tasmin 280i, Ducati Multistrada 1200s, Ferrari F355 Berlinetta, Ford GT40 and Lotus Elise. Visit the Wheels Zone with a bigger and better crowd line parade and interactive displays from car and motorbike clubs. The popular Monster Truck arena returns offering demonstrations and passenger rides. The Military Zone & Parade is interactive and explosive bringing re-enactors in a living history zone and our popular military vehicle parade. The Zone has over 80 military vehicles, six re-enactment groups, as well as the history of Dunsfold Aerodrome and Army, Navy and RAF recruitment stands for everyone’s enjoyment. The excitement and anticipation doesn’t stop at the main displays as the 32 acre public arena is bursting with a huge variety of interactive attractions containing all you need for a great family day out. The show arena boasts go-karts, kit-plane demonstrations, aviation and motoring simulators, military outlets and displays, static aircraft, fairground and over 80 retail outlets selling a wide variety of products and gifts. Shopping in the arena includes a craft marquee full of tempting tea time treats to take home and craft gifts and a vintage village. Taking the hassle out of your day the show includes added extras to make your experience even more enjoyable; over 20 fixed-price catering outlets, two bars, hospitality facilities, free on-site parking, public camping, lost children point, disabled access, informative show commentary, opportunities to meet the pilots, official show merchandise and grandstand seating. The 14th annual Wings & Wheels will be held over the August Bank holiday weekend; Saturday 25th & Sunday 26th August 2018, at Dunsfold Park near Guildford, Surrey, and is open to spectators from 09:00 until 21:00. Advanced rate tickets from £24 for adults or £55 for a family. Single child tickets (for children aged 5 – 15) will be £8. Children under 5 go free. Hospitality packages start from £199 per person, weekend passes, grandstand tickets and camping are also available. For more information visit www.wingsandwheels.net or to book standard tickets call 08712 305 572. Wings & Wheels is promoted by Dunsfold Park Limited and in 2018 will be assisting the fundraising efforts of Brooklands Museum Trust and Help for Heroes.